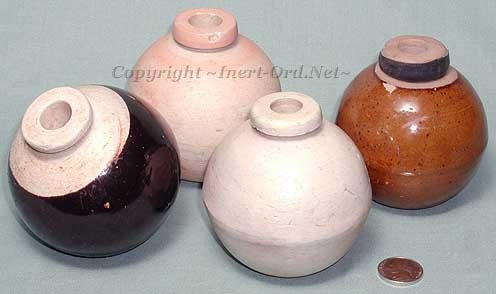 Also know as the "Pottery", "Last Ditch" or "Ceramic" grenade, it is more formally identified as the Type 4. To ready the homeland defense in 1945, these were issued to the mainland Japanese population, intended to be used against the anticipated offensive by Allied Forces. Some had evidently been supplied to front line troops as well but it is not clear if they were used in any significant numbers. It had a carrying/throwing lanyard around the neck. A rubber boot on top covered a wood friction fuze plug and separate scratch block lid. (Note the grenade at top right has the remains of that rubber cover.) The covering was removed and the match compound was ignited much like a road flare using the scratch block. The fuze cannot be inerted without destroying it, so these are probably never going to be found with that original component (as an inert item). It had a 4-5 sec delay element with a high explosive filler. Measuring approximately 80mm in diameter, they are usually found plain and unmarked but can be found in various shades of brown or tan. Made of heavy terra cotta, these are lightly glazed inside and out.